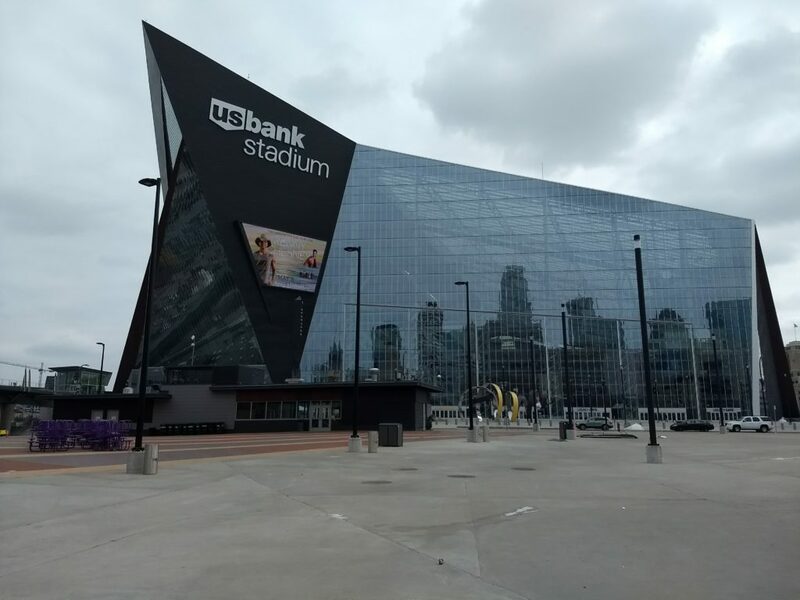 Having spent enough time touring in and around Minnesota i hadn’t really visited Minneapolis. 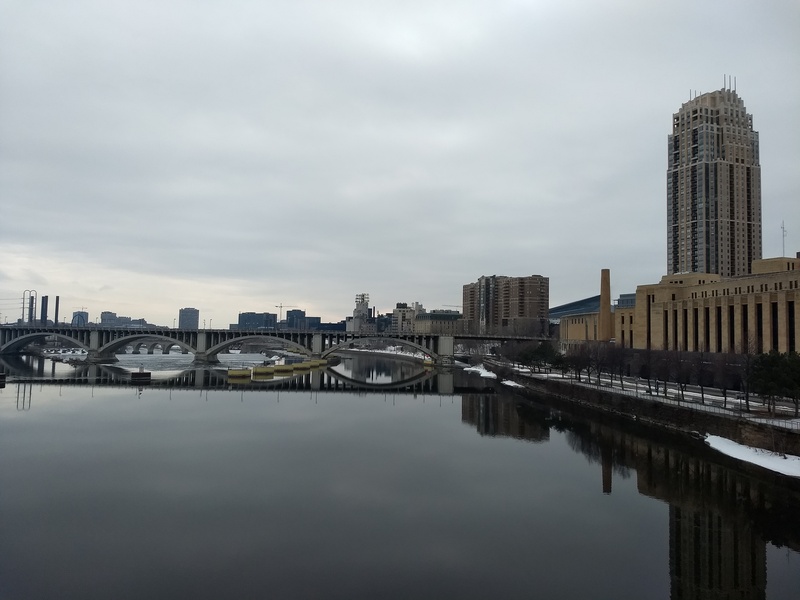 Minneapolis can be accessed easily by various transpotation methods. 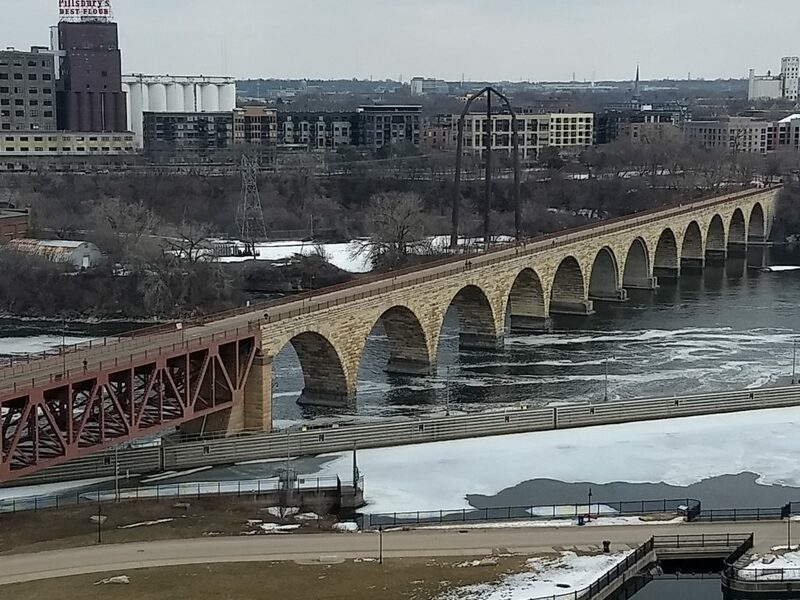 Theres a good bus network, both local and further afield and the light rail system connecting all the main landmarks. Best still its all run by the same company so you can buy a day pass and use all of them without worry. I headed downtown to the river area which is steeped in flour making history !! 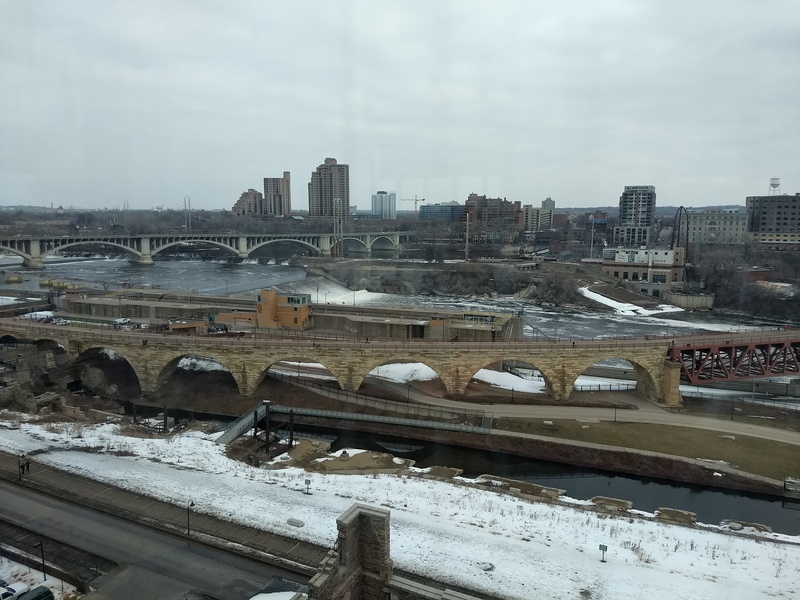 Little did i know before i arrived but Minneapolis was once the flour making capital of the world !! 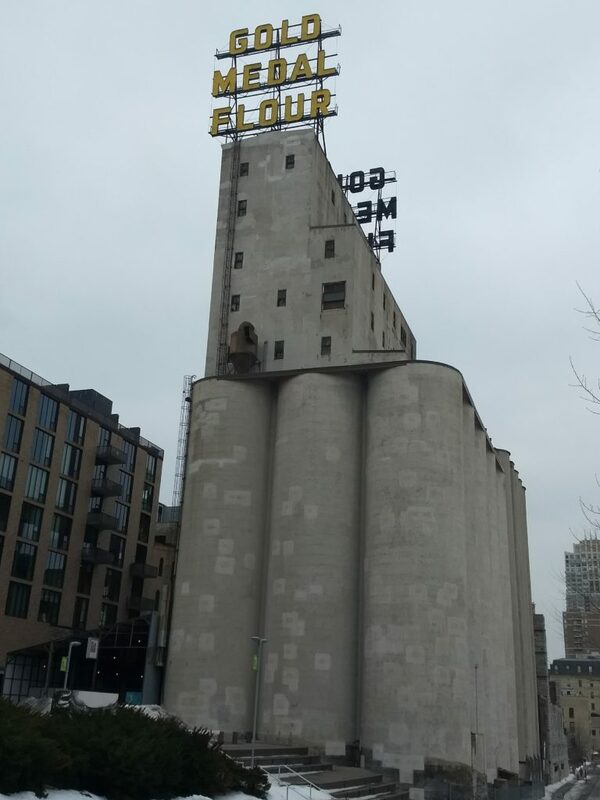 There was literally more flour produced here than anywhere. The wheat was brought in from the Dakotas and other areas and all processed here. Why ? 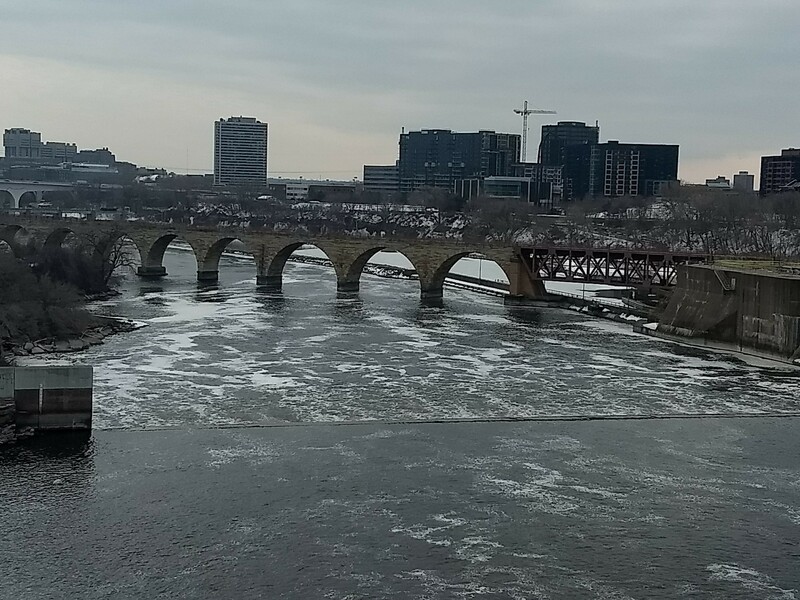 Because of the only natural water fall on the Upper Mississippi River – St Anthony Falls. Settlers came from far and wide and built a town around the falls. 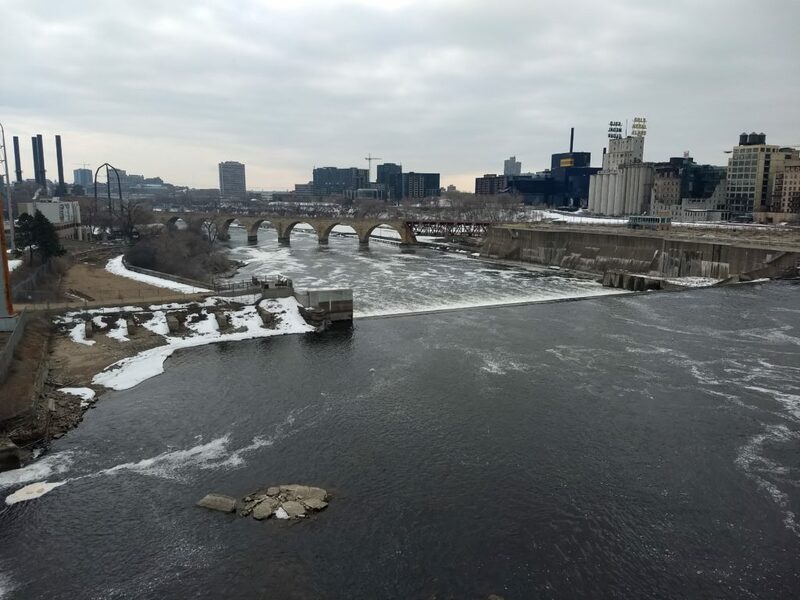 There was once more than 20 flour mills in operation all at the same time surrounding the river. 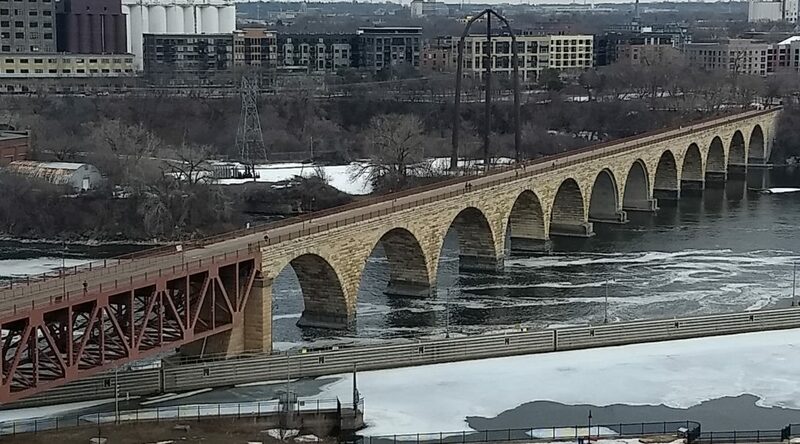 The famous stone arch bridge, now used as a footpath and cycle path. Where old meets new. One of the oldest and largest flour mills which was mostly destroyed in a massive explosion. There is now a flour mill museum integrated into it showing its history. 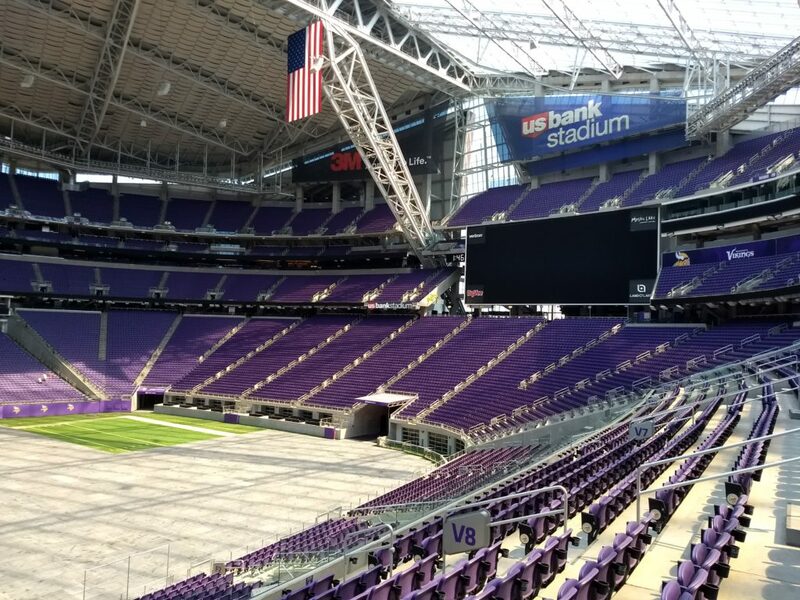 Later on i went back to the US Bank Stadium for one of their public tours. Twenty bucks buys you a one hour tour of the premises along with all of the amazing facts that go with building something of its size. To lift the roof into place they had to get the third largest crane in the US. 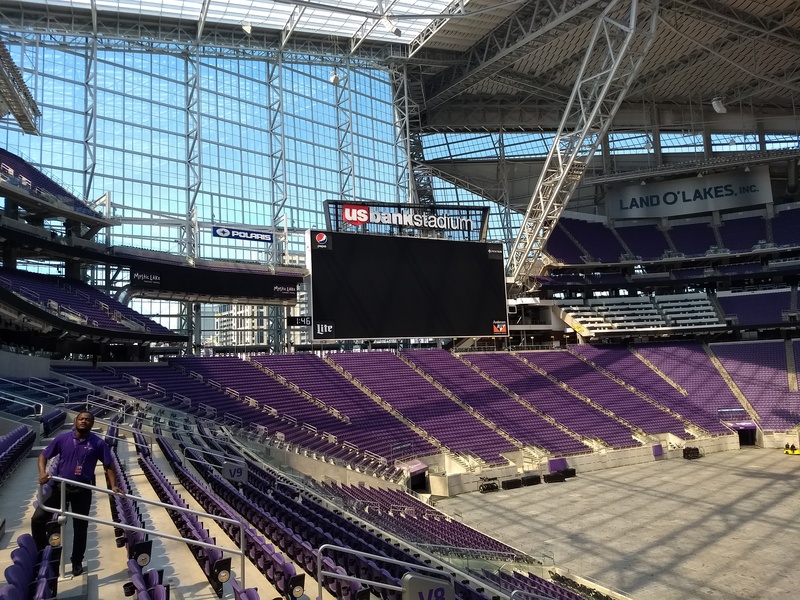 It had to be dismantled and taken inside the stadium before being reassembled to use. Clearly the most interesting fact was that to ensure all the beer pumos worked correctly, there had to be 33 miles of pipework !! 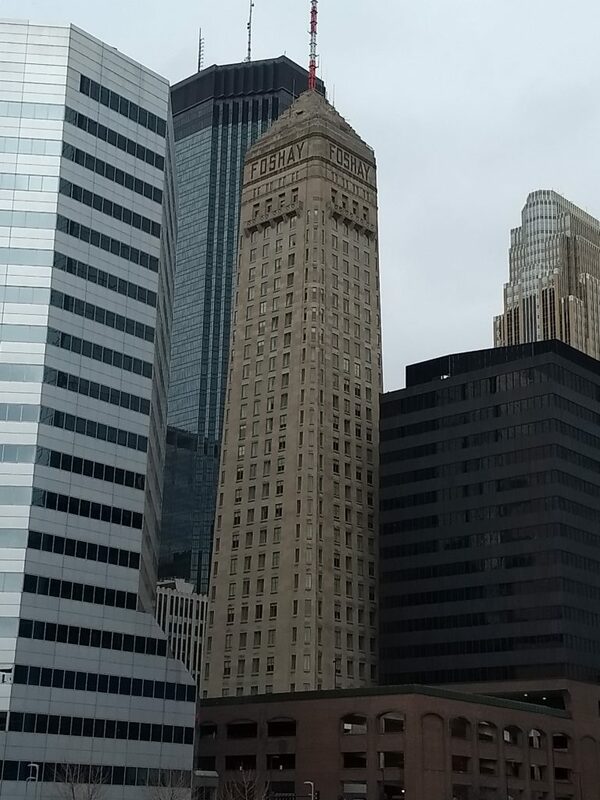 The Foshay Tower was funded by Wilbur Foshay a self made millionaire. He completed his dream of building the tallest building in Minneapolis in 1929. Sadly this was not great timing though as soon after it was finished came the Great Depression. In 2006 work started to turn the iconic building into a hotel which opened in 2008. It is now surrounded by many newer office blocks and skyscrapers. 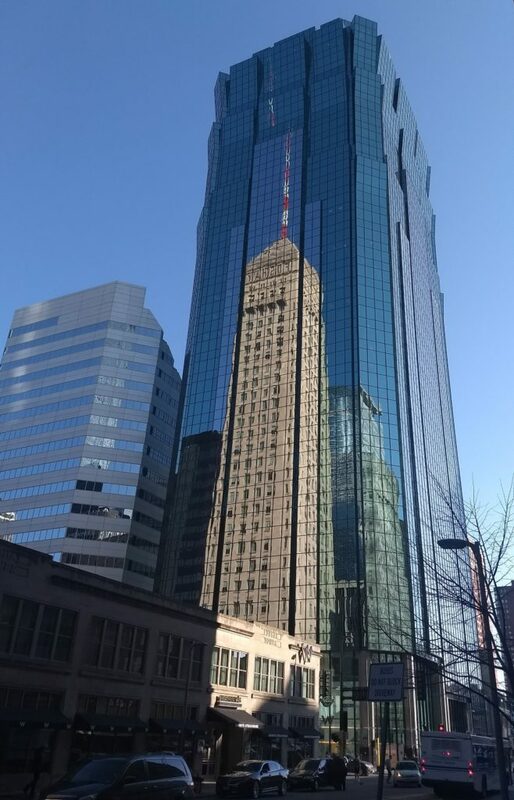 A few days later revealled this reflection in one of the newer mirrored glass office blocks. Most of minneapolis seems to be full of office blocks with vey few shops, unless you go into the malls. I was also surprised by the lack of any convenience stores, nowhere to buy a can of drink or Mars Bar ! As it was only a couple of degrees above freezing it was time to give up on the waling tour. 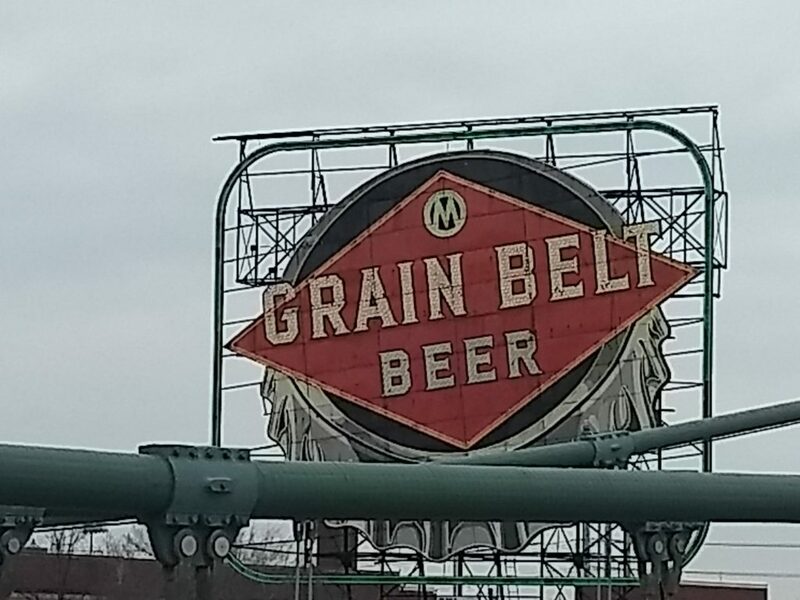 I soon found a couple of breweries to visit ! There are quite a few breweries in Minneapolis just like there seems to be in every American city !! I visited the Clockwerks Brewery on north 4th street, a brewhouse with a funky taproom. 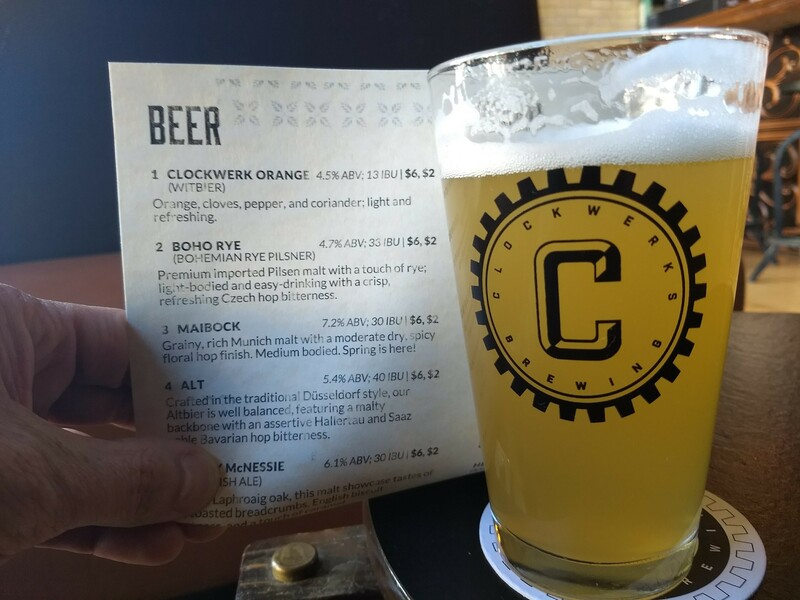 I tried the interesting Clockwerk Orange – a beer brewed with orange, cloves, pepper and coriander. Certainly warmed me up ! 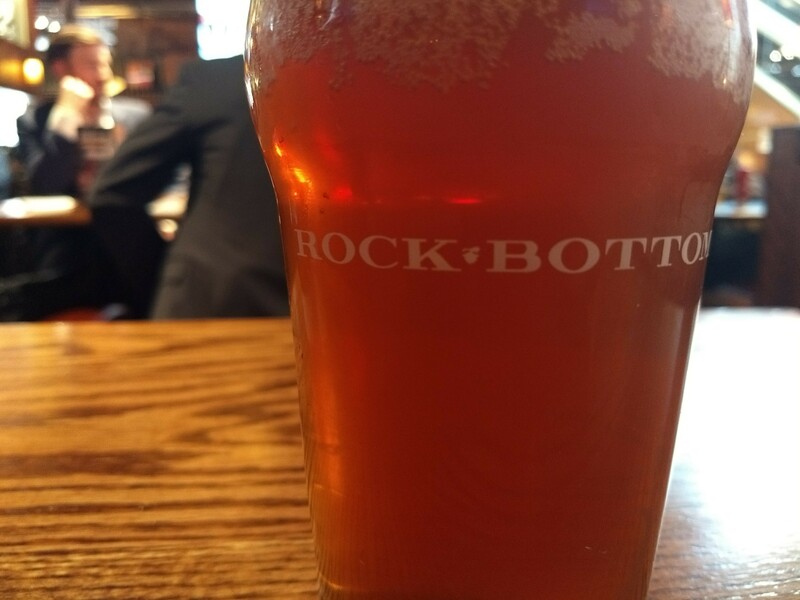 The Rockbottom brewery was only around the corner too in Hennipin Avenue, another place that brews beer on site. 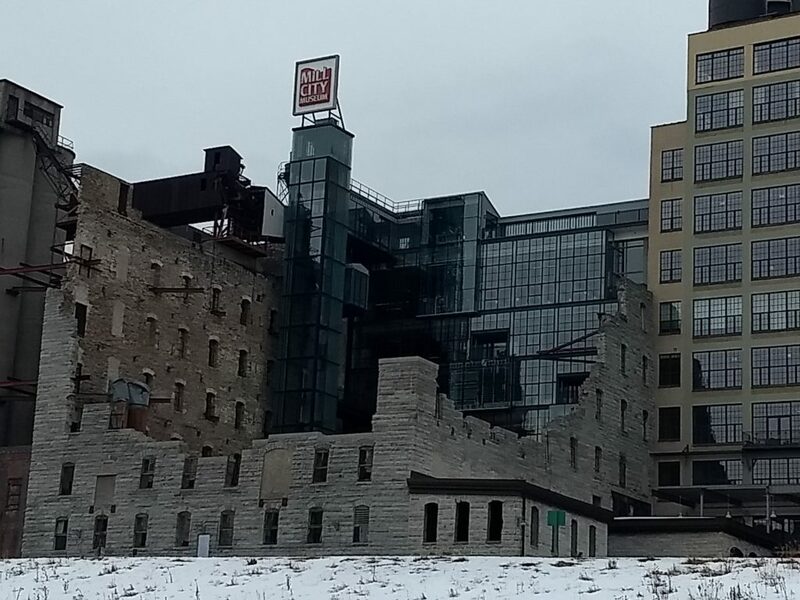 Some of the best known breweries in Minneapolis include the Surly and the Summut brewery. But there are many others to choose from – the craft ale scene has really taken off in Amercia !! I’m sure there was many more things to visit in Minneapolis but the freezing temperatures got the better of me !! 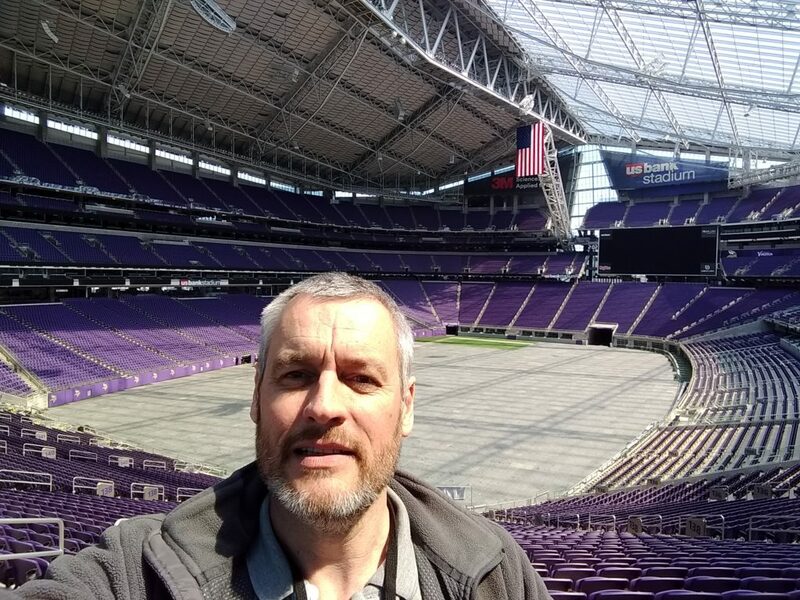 Previous PostOut And About in Minnesota ! 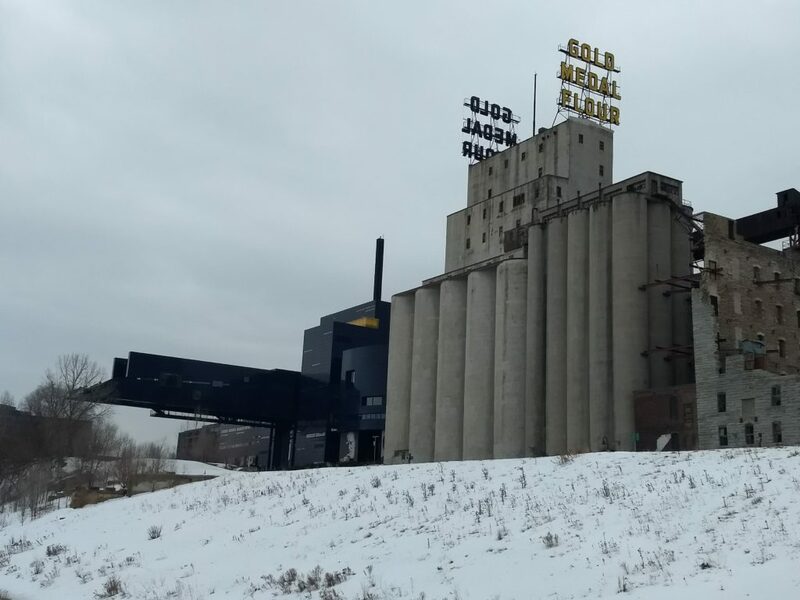 !Next PostBrewery Tours Milwaukee.